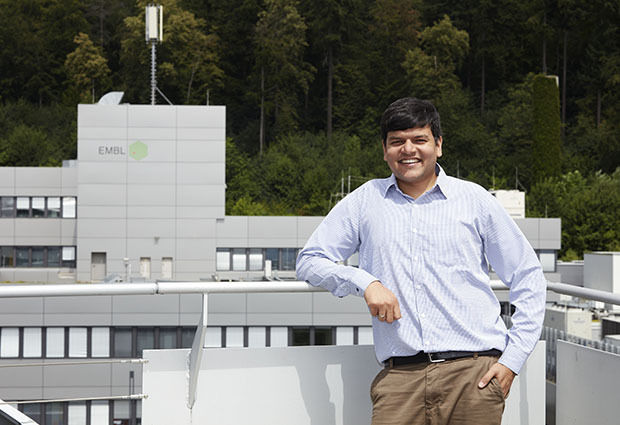 Vikas Trivedi will join EMBL in October as a group leader in Barcelona. His group will combine engineering and biology to understand how groups of cells, such as developing embryos, self-organise. You studied engineering, how did you transition to biology? My undergraduate course was interesting because we applied engineering approaches to biological subjects, so I’m trained to understand biological systems using basic principles. When I went to Caltech for my PhD I was exposed to a lot of different biological systems and especially to problems related to imaging, where there’s a very natural place for engineering to be applied in biology. One thing just led to another, so it was a natural change. Perhaps my only conscious decision was the approach I would take towards the problem. Whatever tool was needed – whether molecular, computational or optical – I was willing to develop it. My research involves understanding how embryos are patterned to form the three body axes – head-tail, front-back, and left-right. These axes together define a coordinate system within the developing embryo that lays the foundation for future placement of organs. Axis formation is common to all animal species, from worms and insects to humans. Thus there is something really fundamental about the way early embryonic cells talk to each other and form a functional organism. 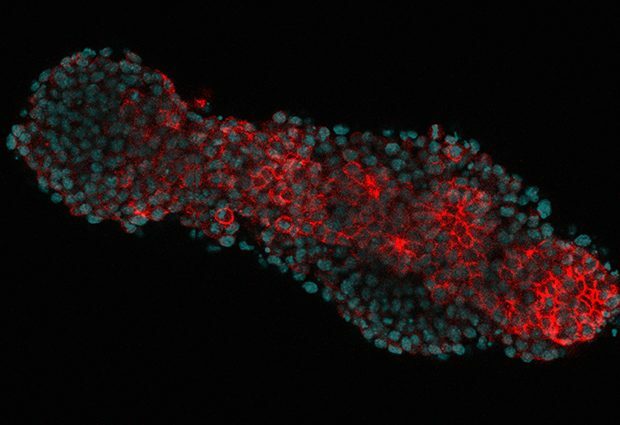 We want to understand the true self-organising potential of embryonic cells and investigate how different organisms generate different structures – even though the basic genes and signalling molecules involved in the cell cycle, growth, or death are similar in a wide range of organisms, especially at early embryonic stages. Coming from an engineering background, my approach is to tinker with parts to build units. When we study development in embryos there are always external constraints – like extra-embryonic tissue or yolk or different egg geometries – that we think have an impact on the embryo’s development. So our idea is to remove all these external constraints and observe what happens. We work with embryonic stem cells from mice or fish that can form embryonic organoids – miniaturised and simplified versions of embryos that we produce in vitro. Since we can control their environment, we know exactly what conditions their cells are experiencing, so their behaviour can be studied. We also hope to understand how the chemical signals from the extra-embryonic tissues – which are present in a real embryo but do not become part of the developing animal – play crucial roles in the embryo’s development. The process of axial patterning has developed in subtly different ways in different species, as a response to different embryo-specific geometries and environments. My scientific goal would be to learn if there are any fundamental modes of animal development which underlie this process of axial patterning. Ultimately, we would like to understand enough about how cells work to be able to instruct them to do what we want them to do. Also, since I will be at EMBL’s newest site in Barcelona, I hope I will have a chance to contribute to the development of the institute. How do you feel about becoming a group leader? I’m very excited! It’s like building a home: one has to settle down and recruit the right people who – hopefully – will understand each other. I’m quite keen on letting my team grow slowly and organically. Being a good colleague and having good colleagues around you is crucial for enjoying science. What will you be looking for while you build your team? I’m looking forward to having a very dynamic lab: I want to attract students, postdocs and visitors from different fields. My transition from engineering to biology taught me that science benefits from being interdisciplinary. I want to have people from all backgrounds and I want them to have cross-disciplinary conversations and come up with new ideas. But my first priority will always be to ensure a healthy atmosphere in the lab where people can discuss ideas freely and work together synergistically. Microscopes! They’re essential to understanding cell behaviour and are of the utmost value to my research. Can you recall a time over the course of your career when you have failed? Yes! During my PhD I was lucky enough that I didn’t have to stop my project, but the direction of my PhD definitely changed over the years. I started with certain ideas of what I wanted to do but it turned out that was not possible, so I had to shift my focus. Fortunately, the lab where I was had a very encouraging philosophy about failure: there will be another opportunity. So, this is how I try to approach it. What elements have been key to your success? The people around me. I’ve been very lucky to have met people who really supported me in both my professional and personal life. Curious, excellent scientists who were generous and spent time, energy and effort in teaching me – and also giving credit. Not being territorial is something that I think is crucial for scientific success. To be honest, I don’t know! As a child, I liked the process of asking a question and thinking my way logically to the answer. That’s what attracted me to science – you can understand the world by making very simple assumptions about it, and then you can test those assumptions. The fun begins when those assumptions or intuitions go wrong, which is often the case.